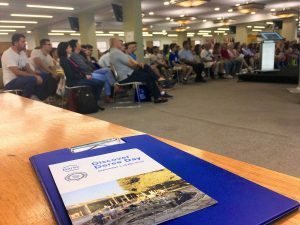 The American College of Greece | The future can be explored: Prospective students delve into academic options and future opportunities on Discover Deree Day! 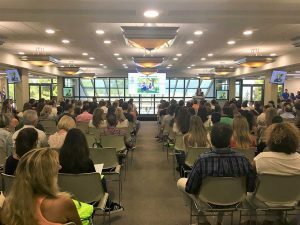 Home » News & Events » News » The future can be explored: Prospective students delve into academic options and future opportunities on Discover Deree Day! The future can be explored: Prospective students delve into academic options and future opportunities on Discover Deree Day! 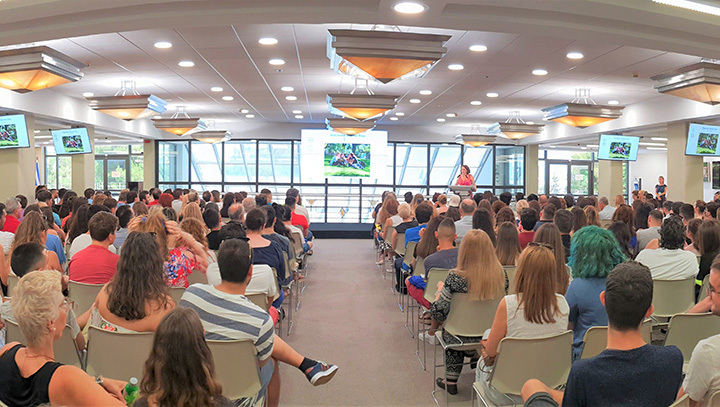 Another highly successful Discover Deree Day (DDD) took place on Saturday, September 1, with more than 170 prospective students and their parents taking a sneak peek into Deree’s unparalleled college life! The campus filled up with young people and their families looking to explore all there is to know about Deree. Visitors took guided tours around campus and prospective students got a special inside look at the academic journey ahead by sitting in on an actual college class. All visitors attended a full-house information session held at the Upper Level Library. Dr. Dimitris Andreou, Vice President of Enrollment and Administration presented to all guests the numerous on and off-campus opportunities that are available for all students to explore, including academic and athletic scholarships, personalized career counseling, rich student life and much more, making Deree an excellent educational choice. 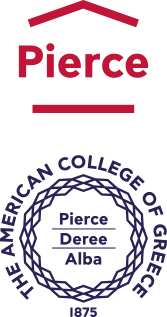 Dr. Helena P. Maragou, Dean of the School of Liberal Arts and Sciences and Director of the Honors Program, then presented the innovative academic programs and unique opportunities available at ACG. Finally, current students and alumni shared with the audience fond memories from Deree and invaluable student life experiences. The day continued with a meeting at the Student Lounge where visitors had the chance to discuss with Deree faculty about the 26 innovative academic programs, career opportunities domestically and internationally, Study Abroad possibilities, and more! Discover Deree Day concluded with visitors and members of the ACG community coming together on a networking event over snacks and refreshments.